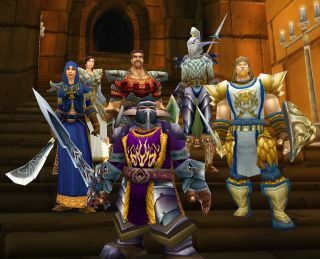 If everyone who played World of Warcraft picked up a real-life weapon, they would outnumber the combined count of the ten biggest armies in the world, including China, Russia, the US and India. Blizzard Entertainment now has over 11.5 million subscribers in its thrall worldwide, with the Wrath of the Lich King adding milions more since its launch in November. Wrath of the Lich King was the fastest selling PC game of all time - selling 2.8 million copies in its first day of availability and smashing a record set by... you guessed, previous WoW expansion set, The Burning Crusade. "We're pleased to welcome the new and returning players who have helped World of Warcraft reach these new milestones," said Mike Morhaime, CEO and cofounder of Blizzard Entertainment. "Now, would everyone please just hand over their nukes and crown me as king of the world?" China is even home to a WoW-themed restaurant (see footage here) but the World of Warcraft backlash is already beginning. The New York Times is reporting that some employers are specifically excluding WoW players from vacancies. The paper quotes a recruiter saying, "There is a belief that WoW players cannot give 100% because their focus is elsewhere, their sleeping patterns are often not great, etc." Hey, I'm not addicted. I could stop any I want. It's just that I don't want to. And what's wrong with poop-socking, anyway?